We covered how to clean your car’s exterior like the pros. Now, we’re going to tackle the inside of your car. First, when cleansing the interior with gentle rags and solution, don’t be too rough. Especially try to avoid wiping down the headliner of your car, these are very gentle and can fall apart easily. Pro tip: save cleaning the interior of the windows until the very end. When wiping down smaller parts, take apart whatever you can. A small step like taking out the cup holders or air vents when possible goes a long way. It is much easier to clean and you can get in the deep crevices otherwise impossible to reach. The hardest thing to imitate from a dealership clean is the vacuum job. I don’t think I’ve ever seen cleaner carpets than after I pick up my car from the wash. To get these results, I would suggest taking some sort of tough brush and running it through your carpet before vacuuming. It will loosen up the dirt in your carpet and free it, so the vacuum can really get every last bit. For even tougher items to remove, such as pet hair after a road trip with man’s best friend, if you put on a latex glove and rub your hand on the carpet, it will bring the hair to the surface so you can vacuum that as well. 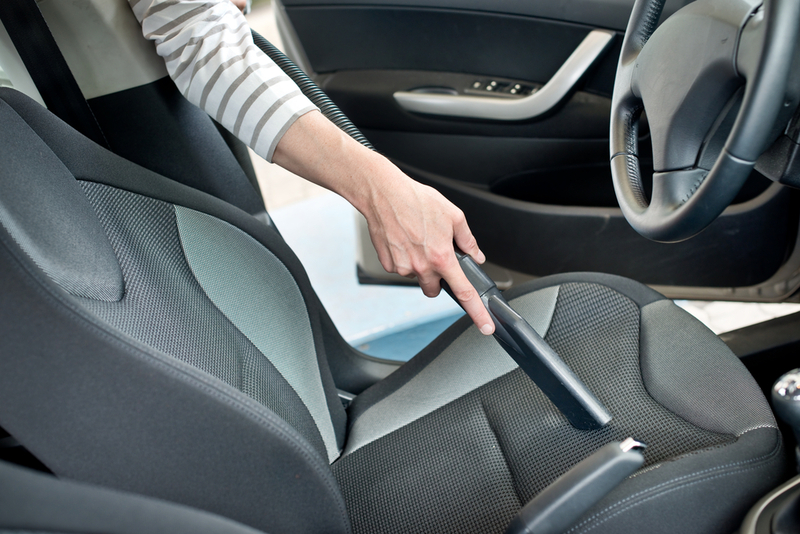 When vacuuming, it is often recommended to use the brush tip instead of the plastic tip because it is much gentler on your car’s interior, not leaving any markings or roughness. For vacuuming the hard to reach places, a narrow, plastic edged extension can be used to squeeze into crevices.